By converting lactose (milk sugar) to simple sugars, lactic acid and the enzyme, lactase, the cultures in yogurt allow many lactose intolerant people to benefit from the nutritional value of dairy products. The yogurt cultures are providing a cleaning service for your digestive tract as they continue through your system by converting and processing waste. They also reduce the conversion of bile into bile acids and deactivate nitrates and nitrites, which can become carcinogenic. 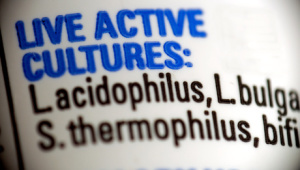 Yogurt cultures promote the production of hydrochloric acid, which can improve your digestion. As a rich source of calcium, yogurt contributes to colon health by discouraging excess cell growth in the colon and by binding bile acids to keep them from irritating the colon. An 8-ounce serving of yogurt contains 15% of the adult daily protein requirement, and the culturing of the milk protein makes it very easy to digest. Recently, researchers have found that yogurt, which delivers protein with a substantial amount of calcium, will enable both adults and children to lose weight in a dramatic fashion. The calcium may reduce fat cells ability to store fat, so more fat is burned by the cells. Or, it may due to the type of amino acids present in dairy products. The best news is that test subjects lost fat, but retained more lean muscle tissue, so yogurt may be the newest secret to healthy weight loss, without giving up needed protein! An 8-ounce serving of Sunrise Farms Yogurt provides 20% of the adult daily requirement for calcium. And, as stated above in Balanced Digestive System, many lactose intolerant people are able to benefit from calcium-rich yogurt as a source for their daily needs. In addition, the calcium is delivered in an acid matrix (lactic acid), which increases the absorption of the calcium. This is particularly valuable for people suffering from osteoporosis, who have difficulty absorbing the necessary calcium to improve their condition. In younger persons, yogurt will boost bone building by providing the calcium, but it also contains lactoferrin, an iron-binding protein that boosts the growth and activity of osteoblasts (the cells that build bone). According to a study with 10 to 12-year-old girls, yogurt was much more successful at building healthy bones than calcium supplements and vitamins. A recent study shows that people who ate 2 cups of live-culture yogurt daily for three months produced higher levels of immunity-boosting interferon. Another study showed a remarkable increase in special white cell production in women consuming up to 6 ounces of yogurt per day (these white cells are our immune system’s first line of defense against infection by viruses, yeasts and parasites, and critical in preventing the development of cancer). Studies have shown that animals that consumed regular feedings of yogurt were able to fight off a pneumonia pathogen in a third of the time that was required for the other group that did not receive feedings of yogurt. Consumption of yogurt seems to be like getting a flu shot, but also can aid in protecting our bodies from much more serious illness! Numerous research groups and studies conclude that yogurt can help prevent some cancers by boosting our immune system (as discussed above). Cultures in yogurt also work to our benefit by cleaning wastes from the colon, by binding bile acids, by deactivating nitrates and nitrites before they become nitrosamines- – all of which can reduce the risks of colon cancer. Additionally, a study group finding, involving full-fat yogurt and other dairy indicated that colorectal cancer is reduced by daily consumption of these products. Recent laboratory studies in Israel indicate that yogurt’s cultures prevent and heal arthritis. The lactobacillus in yogurt seems to provide the benefits, much the same way they work positively in other inflammatory diseases, such as inflammatory bowel disorders. 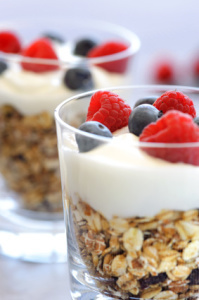 On-going studies of yogurt’s effect on cholesterol indicate that LDL (bad) cholesterol is decreased significantly by consumption of 3 ounces of yogurt per day. Researchers are not sure whether the live cultures assimilate the cholesterol, or whether the yogurt is binding the bile acids (which has also been shown to lower cholesterol), or both.